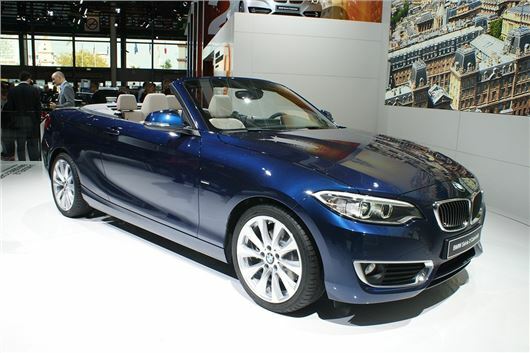 The new BMW 2 Series Convertible has been officially launched at the Paris Motor Show. The third body style of the 2 Series range, it comes to the UK market in February 2015 and joins the 2 Series Coupe and the Active Tourer MPV. The new two-door drop-top comes to the UK with a four-strong engine range to start with: three petrol units and one diesel, each more powerful and more economical than its equivalent in the 1 Series Convertible, which the new 2 Series replaces. The entry-level car is powered by a 2.0-litre petrol engine with 183PS, boasting 41.5mpg, 159g/km and a 0-62mph dash of 7.5 seconds. Badged 220i, it will be priced from £29,180. The single diesel, initially, is the 220d, with a four-cylinder 2.0-litre 190PS diesel getting the car to the 62mph benchmark in the same time as the 220i, but returning 60.1mpg combined and 124g/km CO2. The 220i’s 2.0-litre turbo engine is tuned up to 245PS in the 228i, reducing the 0-62mph dash to 6.1 seconds while fuel economy remains at 41.5mpg. Finally the range-topper, the 326PS M235i – the first small BMW convertible that M Division has given a work-over – is capable of a 5.2-second 62mph time, thanks to three litres, six-cylinders and a twin-scroll turbocharger. The automatic version, equipped with an eight-speed transmission, is 0.2 seconds quicker still. BMW says that the 2 Series Convertible range is, on average, 18 percent more efficient than the outgoing 1 Series Convertible. It’s almost impossible to be revolutionary with any small convertible because of the inherent packaging restrictions, but BMW has made small steps throughout the 2 Series Convertible to improve the owning experience. These include a bigger boot, up from 305 litres in the 1 Series to 335 litres here, while the electrically operated soft top contributes to a 4db noise reduction and takes 20 seconds to open or close, at speeds of up to 31mph. A through hatch is optional, while the aperture thorough which unlucky rear seat occupants must clamber is now a little wider – 11mm, in fact. The car also boasts more storage compartments, including bigger storage pockets and a couple of cup holders. On the dynamic front, the track is 41/43mm wider (font/rear), and the new roof design makes it more aerodynamic than the 1 Series drop-top was. The chassis is stiffer too, by 20 percent, while weight goes down slightly. Standard electronic driving aids include Dynamic Stability Control, Dynamic Traction Control, Cornering Brake Control, Dynamic Brake Control, and a clever system that compensates for brake fade during heavy use. A limited-slip differential is optional. According to BMW, fuel consumption is decreased by up to 20 percent in Eco Pro driving mode, which alongside brake energy recapture, re-maps the throttle and climate control system for maximum efficiency. In the UK three trims are available: Sport, Luxury and M Sport. The 228i is only available in the last of those trims, while the M235i has a specification of its own. All cars get alloys, air conditioning, keyless go, sports seats, dark chrome tailpipes, and a leather multi-function steering wheel. Luxury trim adds bigger wheels, chrome for the grille and front air intakes, wood interior trim, and nicer leather for the upholstery. M Sport versions, aside from numerous badges, get high-gloss ‘shadowline’ exterior trim in various places, M Sport suspension, M Sport leather steering wheel, an aerodynamic body kit and M doorsill finishers. The M235i’s unique specification includes 18-inch alloy wheels, grey mirror caps, dual-zone air conditioning, Dakota leather upholstery, an M Division rear spoiler and M logos on the wings. The official on-sale date of the 2 Series Convertible in the UK is 28 February 2015.